The Secretary-General has described the rule of law as “a principle of governance in which all persons, institutions and entities, public and private, including the State itself, are accountable to laws that are publicly promulgated, equally enforced and independently adjudicated, and which are consistent with international human rights norms and standards. It requires, as well, measures to ensure adherence to the principles of supremacy of law, equality before the law, accountability to the law, fairness in the application of the law, separation of powers, participation in decision-making, legal certainty, avoidance of arbitrariness and procedural and legal transparency.” (Report of the Secretary-General: The rule of law and transitional justice in conflict and post-conflict societies (S/2004/616). Recognising the central place of the rule of law, the General Assembly at its 67th Session, held a High-level Meeting on the Rule of Law at the National and International Levels on 24 September 2012. This was a unique occasion for all Member States, non-governmental organisations and civil society represented at the highest level, to commit to strengthening the rule of law. The High-level meeting concluded with the adoption by consensus of a Declaration in which Member States reaffirmed their commitment to the rule of law and elaborated on the efforts required to uphold different aspects of the rule of law. The Declaration recognises “that the rule of law applies to all States equally, and to international organizations, including the United Nations and its principal organs, and that respect for and promotion of the rule of law and justice should guide all of their activities and accord predictability and legitimacy to their actions. 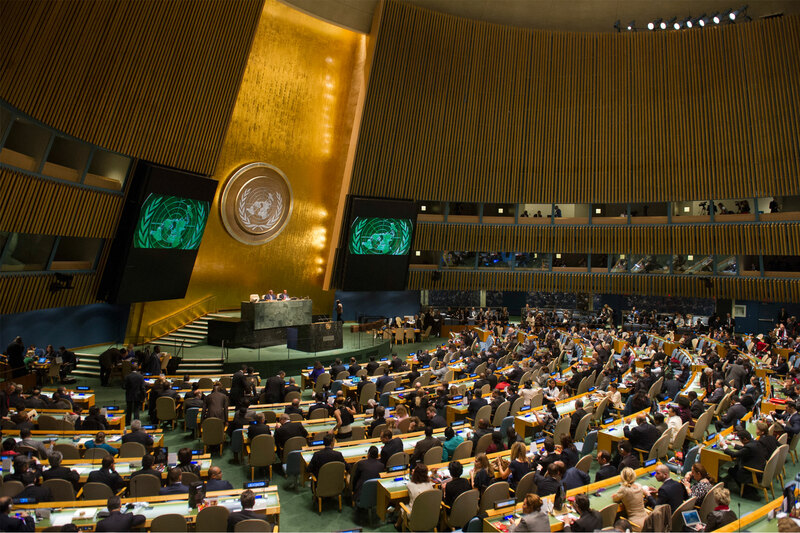 The Declaration highlighted the rule of law as a cross-cutting issue, linking the three pillars of the UN: peace and security, human rights and development. These linkages between the rule of law, human rights, peace and security and development have been further elaborated in the addendum to the 2014 Report of the Secretary-General on Strengthening and coordinating United Nations rule of law activities (A/68/213/Add.1).